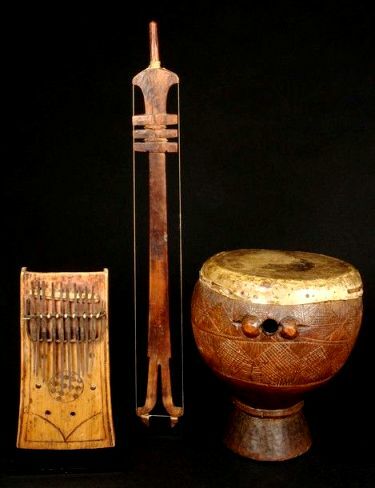 Musical instruments in Africa are not only used for making music, they are also used to communicate to both man and spirit, translating and emitting daily experiences and events. They serve a variety of roles: some may be confined to religious or ceremonial occasions, others are used in a more secular fashion for entertainment. There may be restrictions to the age, gender or social status of the player. 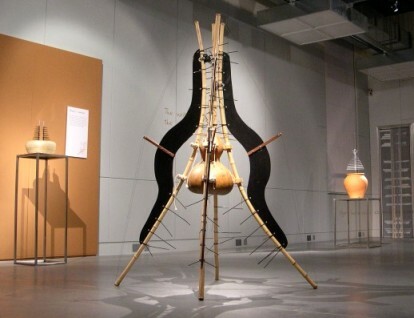 The instruments range in size and complexity from hand-held objects to large, elaborate devices constructed of many parts and, even today, they are mostly crafted from natural materials using age-old methods. Most widely spread and played instruments in Africa are the drum, the xylophone, the mbira, rattles and shakers. 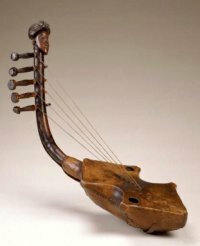 The one-string musical bow, played all over the continent but now nearly abandoned, was once responsible for all the vocal scales that are used today in African music. Historical influences and migratory movement of peoples have defined both the style of music and the type of instruments played in the various regions. Most notable is the influence of Islamic and Arabic musical traditions into the northern and western African countries. Idiophonic instruments are the easiest to play and to source and construct. 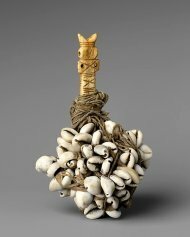 One of the oldest is the Gankogui, a bell instrument played by the Ewe people of Ghana. 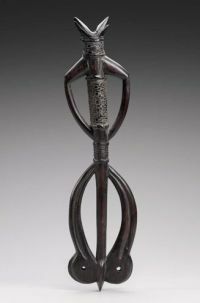 Made from forged iron, the double bell is gonged with a wooden stick to make a deep resonating sound, the basic skeleton of all orchestral music played in Togo, Ghana and Benin. 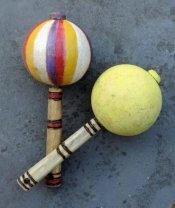 Bells and rattles have ritual or ceremonial functions as well as just for fun and play. Rattles and shakers are widely placed all over Africa and exist in a huge variety of shapes, sizes and materials, both natural and man-made.... like using animal gall bladders, leather, baobab fruits, coconuts, cowrie shells, coke cans, bottle tops, vegetable gourds, bronze bells, reeds... whatever can be shaken and rattled! Shakers or shekeres are filled with anything from dried seeds to maize kernels to fine pebbles and stones. 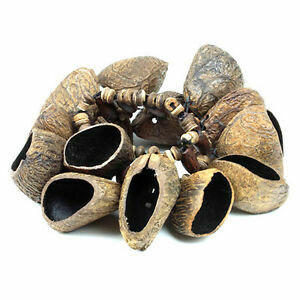 They are primarily made from dried vine gourds. There are primary and secondary shakers. Primary are hand held and secondary are worn on various parts off the body like wrists, ankles and are activated by the performers. They can also be strapped to their instruments to make extra sounds or act as modifiers. Scrapers are notched pieces of bamboo or wood over which a stick is rubbed. 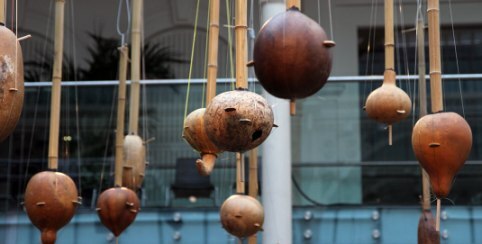 - Melodic idiophonic instruments such as lamellaphones and xylophones. Sounds are generated by plucking flexible, tuned tongues of metal, wood, cane or other material attached at one end to a small board or mounted on a resonator such as a box, gourd or tin and plucked with the thumbs or fingers. Simple manual mbiras have 6-8 keys but they can go up to 36 keys. These instruments are usually played by men and boys but increasingly so by females. 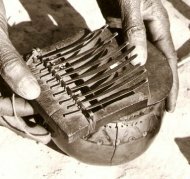 The Mbira Dzavadzimu "voice of the ancestors' has more than one layer of 'tongues'. A typical one consists of between 22 and 28 keys constructed from metal and affixed to a hardwood soundboard in 3 different registers, 2 on the left and 1 on the right. Kangobela is a unique form of music played in the Binga district of Zimbabwe. 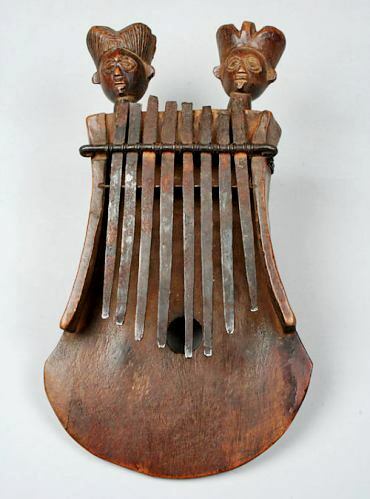 It is played with an instrument akin to the mbira but with lesser keys in its notes. 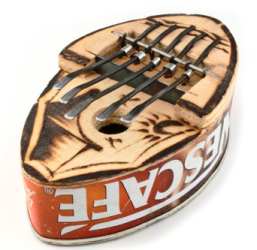 A kalimba is a South African version of a mbira that is tuned into a western scale but historically it was the name given by the NW tribes of Zimbabwe. 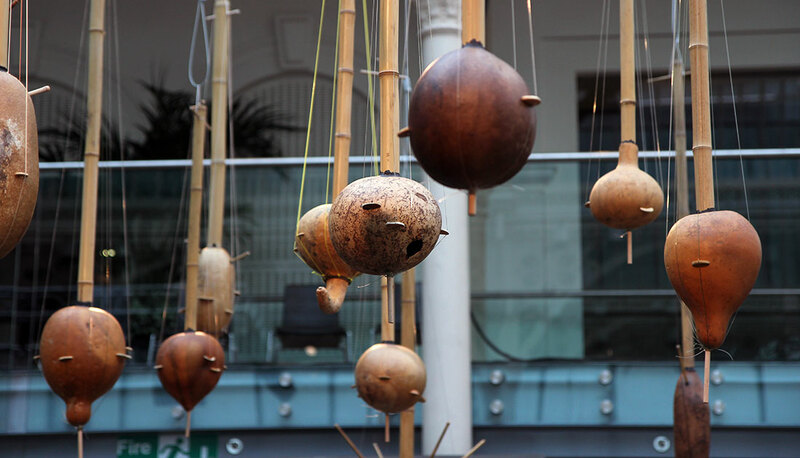 Xylophones are generally a box shape with keys mounted over a wooden frame and gourd resonators suspended underneath. The frame can be low to the ground or mounted on legs. The gourds are graduated in size in relation to the pitch required of the wooden slabs. 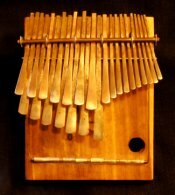 Some xylophones like the Amadinda do not have resonators. They have a very long history in Africa and can be seen as a musical imitation of a language. 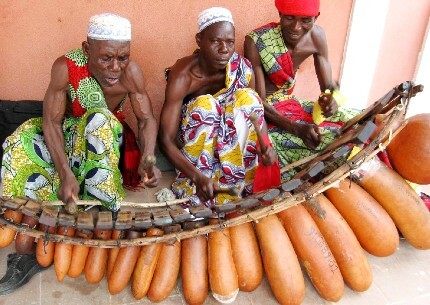 "Sosso bala" is the name given to a xylophone which is a national treasure of Guinea, only recently returned from France in 2002. Its 800 year old legacy is being kept and preserved by the Kouyate family in a village in Guinea, reminding the Mande people of their glorious past. The Gyil is the national instrument of the Lobi and Degara people of Burkina Faso, Ghana and the Ivory Coast. With 14 wooden slats it is played by just about every male in the community to some degree of competence. However the main musician will spend a lifetime composing and perfecting his play before he is considered worthwhile of addressing the ancestral spirits. 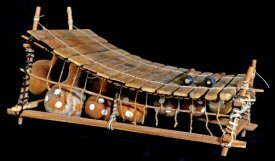 A kogyil is played at funerals and a borgyil at festivals. 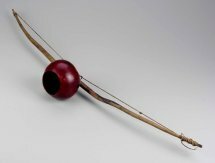 Musical bows are mostly played in Southern Africa and include earth bows (flexible pole in ground, bent with string attached), mouth bows (the mouth helps the amplification when struck) and resonator bows like the one above which has a calabash resonator. Sounds are made by bowing, plucking and striking the string. 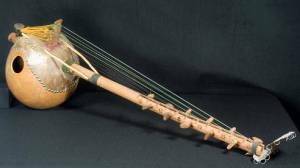 West Africa (specifically Mali and the Mande people) has many of these harp/lute type instruments but the most widely known and used is the Kora. Traditional koras have 21 strings, 11 played by the left hand and 10 from the right. This instrument is played upright with the strings facing towards the player. Stick and trough zithers are positioned horizontally. 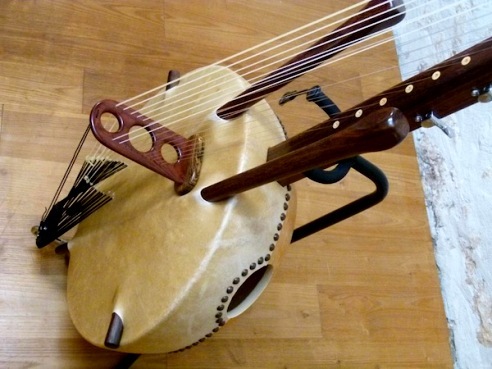 The number of tunable strings on harps vary from 3 or 4 strings such as found on the Bolon or Molo to 7 or 8 strings attached to a notched bridge such as on the Kamel Ngoni. Some of the sounds are similar to a banjo, others to a classical guitar and still others to a harp. They can be listened to as a solo performance or part of a group with flutes and drums. Harps or kundi are one of the main stringed instruments in Africa and these days they are mostly found south of the Sahara. They are quiet instruments that usually accompany a singer or poet in storytelling but they are also used as part of another process...among the Pongwe of Gabon, an 8-stringed Ouombi harp accompanies a song for healing the ill. They have all but disappeared as a practicing instrument from some cultures such as the Mangbetu but are still honoured as art pieces for their detailed and intricate carving (the figureheads often depicting royalty). Aerophones; any class of musical instruments in which a vibrating mass of air produces the initial sound including bull roarers and sirens. They are found in many countries throughout Africa and are normally incorporated with dancing, the musicians having to synchronize their footwork along with playing their notes! Whistles are made from reeds or, these days, metal tubing while flutes are produced from indigenous bamboo or cane. In countries like Chad, Burkina Faso, Sudan, Uganda and the DRC co-operative ensembles of over 100 men flute players are sometimes formed for special occasions. Each flutist has just one note to play; this allows for strong, community performances; each player dependent upon the other for the end result. Horns are generally made from cow horn, ivory or wild animal horn like kudu... the most desirable and sought after horn which is kept for royal occasions. They are side-blown in impressive one note blasts and are used to convey messages, to announce arrivals or proceedings as well as just for musical events. Most commonly played in the Rift Valley countries and Cote D'Ivoire. 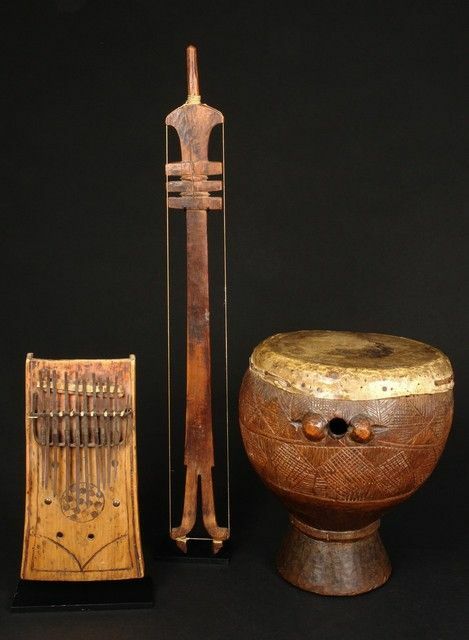 These skin covered instruments form the beat and heart of African music. They generally come in 3 forms - hourglass, goblet and kettle. 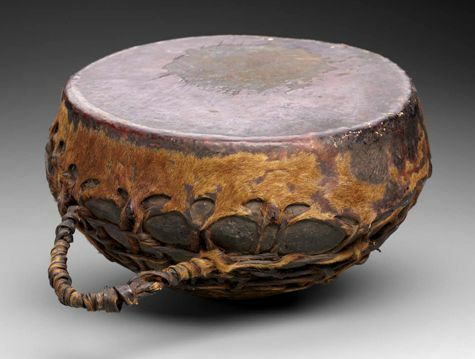 Percussion is integral to African dance and spiritual music. Multiple layers of interlocking rhythmic patterns ensure a vibrant and dynamic performance. The combination of voice and instrument is essential and always accompanied by swaying, clapping and dancing. Singing is a major component of musical expression: Solo, choral, monophonic, polyphonic. Ululating is a long, tremulous and wavering high-pitched sound that is achieved by moving the tongue rapidly from left to right repetitively. It is commonly used in celebrations. 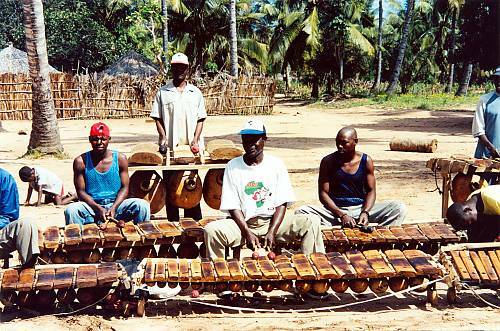 A xylophone can be played solo or in ensembles like the Chopi tribe in Mozambique who use up to 30 instruments in their spectacular and complex timbila orchestras. All members and generations of the family and community play together but, sadly, it is becoming an outmoded form of musical expression. Marimbas are modern xylophones often tuned in western style scale. They come in 3 pitches; bass tenor, soprano and piccolo. 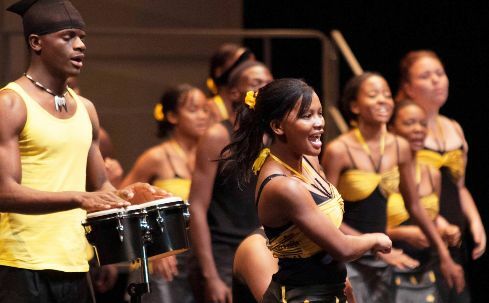 They are taught in schools throughout Africa and both genders play them with up to 8-10 standing musicians hammering it out in joyous and exuberant displays. 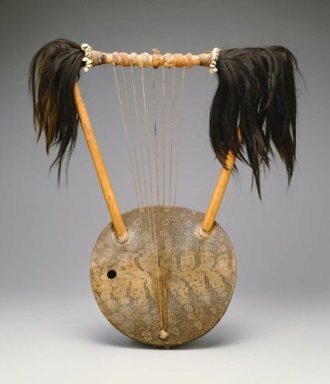 African musical instruments also serve as works of art, carved into surprising shapes, covered with patterns and decorated with beads, feathers, paint or cloth. Sometimes figures are sculpted into the instrument as spiritual tokens empowering the musician to filter the godly or ancestral messages. Great significance of detail is encountered such as carefully stitched hide covering the sound box or figureheads deeply etched and incised showing specifics like hairstyles and earrings. These pieces have been crafted with immense skill and precision, the aesthetics being as important and sometimes if not more than their musical application. Modern African music includes music based on tradition, music fusing Eastern and Western styles and instruments (world music) and music that is very progressive; embracing technology and the very latest of sounds and beats. Instruments continue to be made and produced in many African countries for the commercial market... (like shakers, mbiras, penny whistles, rattles) but others are carved and strung with great care and precision for the many professional musicians and performers on the continent. 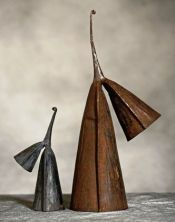 These flutes are made from a woody riverbank vine in Guinea, West Africa. 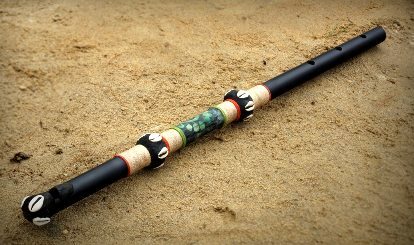 They are termed a transverse 3-holed flute or tambin or fula... made famous by musicians of Malinke flute tradition such as Lancine Conde. 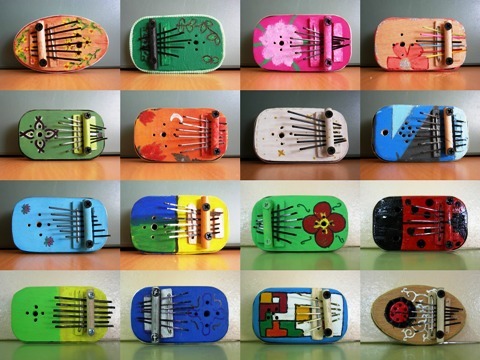 From a fun point of view you will also find many recycled and hand made instruments which bare testament to how important music is to local communities and to how creative and ingenious the people are! There are many, many prominent contemporary African musicians whose mastery of African instrumental music is lauded and appreciated both on and off the Continent. Victor Gama, Angolan born and a composer, performer and designer of innovative contemporary music and musical instruments he is intent on changing the face of African music. He is also an electronics engineer and creates new sounds and new music in a rigorous way. His exhibition performance called "Instrumentos" at the Royal Albert hall in London featured beautifully designed instruments that were highly technical as well. He has performed with groups like Kronos Quartet after a 5 year collaboration with them. Modern styles have been formulated in Africa after Western influences first filtered through in the 1960's. By the early 1970's a percussive style called Juju had evolved; a dense blend of electric guitars and percussion instruments. By the 1980's, African artists like Thomas Mapfumo in Zimbabwe, had moved from playing their traditional style music (in this case, mbira) on the guitar to challenging his guitarists to rather accommodate themselves to the mbiras. Contemporary musicians on the continent have embraced both worlds, entering into collaborations with Westerners who themselves have embraced African style music. The outcome is dynamic and invigorating. Juldeh Camara-Basse, born 1966, West Africa, plays the Riti, a one-string fiddle. He comes from a long history of Gambian griots, (storytellers) and is often seen performing in Paris. 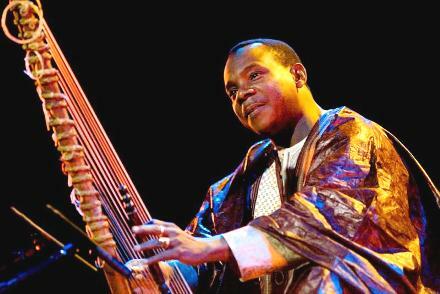 Foday Musa Suso, also Gambian born whose primary instrument is the kora which he plays electrified in a fusion form. Resides in Chicago. 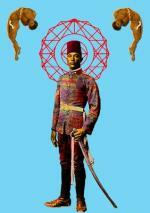 Abdelmajid Bekkas from Morocco has been a star in his won country for a very long time. He is a guitar professor and singer but creates his own music-mix style balancing original Gnawa music with jazz and blues. Diabate family from Mali consisting of Sidiki (Snr), Sidiki (Jnr) and Toumani. Born in 1965, Toumani has been involved with many collaborations. He is a master kora player, sometimes fusing with flamenco. Together with Ali Farka Toure, he has led a whole orchestra composing of musicians from the old Mande Empire of W Africa playing kora, djembe, balafon, bolombatto together with guitar and electric keyboard. Muhamadou Salieu Suso has been playing the kora since he was 8 years old and still plays the 21 string-styled instrument he played as a child... but now in sophisticated performances in Gambia and in the United States. 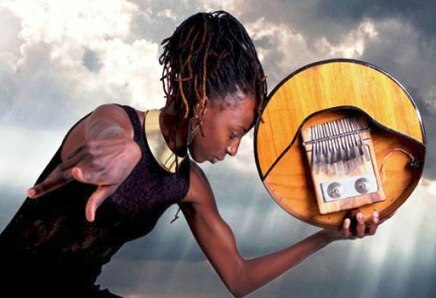 Hope Masike is a musician who resides in Harare, Zimbabwe and essentially plays the mbira but she also plays a number of percussion instruments and has a soulful and sultry voice. Her music is a blend of Mbira, Jazz and Afropop. Her highly charged performances incorporate dance while her personal presentation is elegantly individual and contemporary in approach, conquering with ease her male dominated environment (traditionally in Zimbabwe females do not play the mbira). 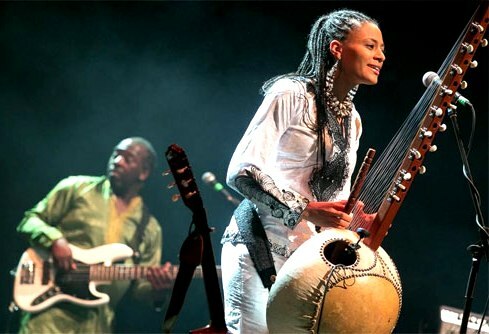 She has been on a number of tours to Europe with her band and has had live collaborations with a number of renowned musicians, most notably with Salif Keita in Harare in 2015.